A refreshing and aromatic lip balm containing essential pine oil and cold pressed oil from Arabica coffee beans. Will leave your lips feeling pleasant and smooth as silk. Dry lips, elbows, knuckles or cheeks can cause trouble for both the young and the old. This lip balm efficiently moisturises and protects dry skin. 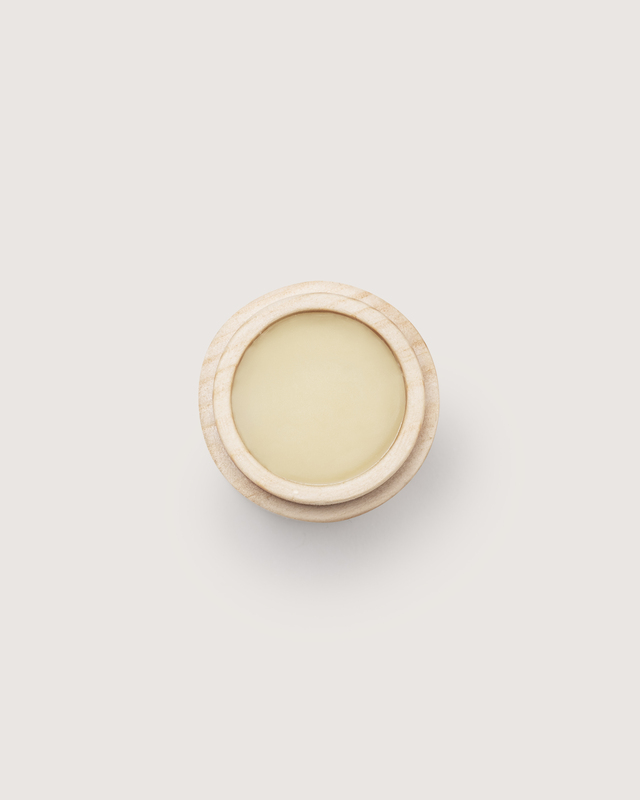 In addition to coffee oil, this lip balm contains plenty of cold pressed vegetable oils which soften your skin - coconut, baobab, and almond oil, as well as shea butter and jojoba wax. This lip balm does not contain water and is thus suitable even for sub-zero temperatures. Coffee butter soothes and refreshes dry lips. Pine stimulates and enhances concentration. 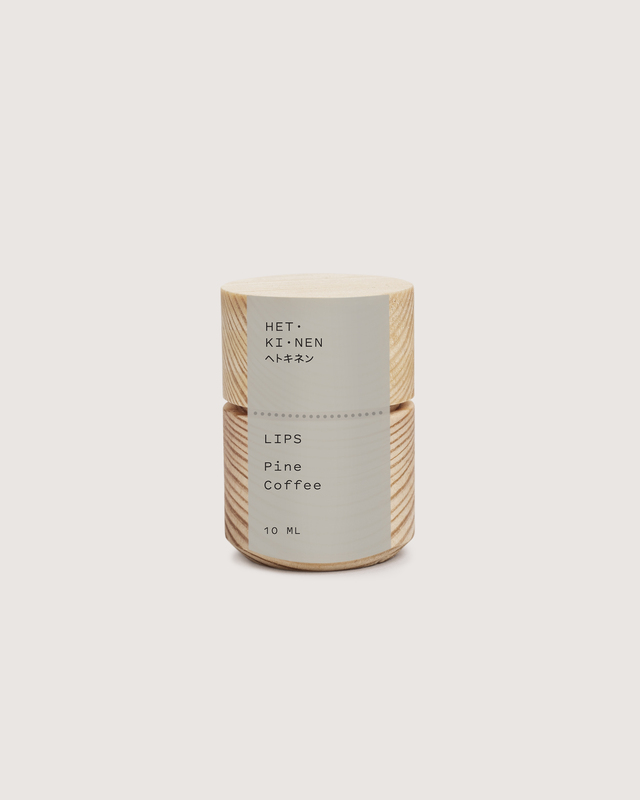 The scents in this product combine two essential Finnish elements: freshly brewed coffee and the Finnish forest. Genuine and authentic. A lip balm that perks you up. Contains caffeine. Take some balm from the tub with the tip of your finger and apply to dry skin when needed. This thick and smooth oil extracted straight out of freshly roasted coffee beans is a dream come true for any coffee lover. The oil moisturises lips and improves their pigment and gives your lips a healthy glow. Coffee oil contains large amounts of essential fatty acids which help keep your lips firm. Baobab oil helps the lip skin cells heal and renew. It binds moisture and enhances skin's natural protective functions. Baobab oil gives you silky and smooth lips. Jojoba wax greatly resembles the sebum that people secrete naturally. It is highly ecological and gentle to the skin. It does not block the pores and it locks in moisture. Jojoba contains vitamin E, vitamins B, and minerals. Jojoba wax makes the product’s viscosity harder and longer lasting. Jojoba wax is a substance that most greatly resembles natural human sebum. It is highly ecological and gentle to the skin. Carnauba wax gives this lip balm its durability and shine. It also softens, moisturises and protects the skin. Due to the small molecular size of its fatty acids, the skin absorbs coconut butter quickly. Coconut butter also balances out the other vegetable oils in the lip balm.